This package contains common methods and classes for ObsPy. It includes the Stream, Trace, UTCDateTime, Stats classes and methods for reading seismogram files. Seismograms of various formats (e.g. SAC, MiniSEED, GSE2, SEISAN, Q, etc.) can be imported into a Stream object using the read() function. Streams are list-like objects which contain multiple Trace objects, i.e. gap-less continuous time series and related header/meta information. Each Trace object has the attribute data pointing to a NumPy ndarray of the actual time series and the attribute stats which contains all meta information in a dict-like Stats object. Both attributes starttime and endtime of the Stats object are UTCDateTime objects. A multitude of helper methods are attached to Stream and Trace objects for handling and modifying the waveform data. A Stream with an example seismogram can be created by calling read() without any arguments. Local files can be read by specifying the filename, files stored on http servers (e.g. at https://examples.obspy.org) can be read by specifying their URL. For details and supported formats see the documentation of read(). Event metadata are handled in a hierarchy of classes closely modelled after the de-facto standard format QuakeML. See the IPython notebooks mentioned in the ObsPy Tutorial for more detailed usage examples. See read_events() and Catalog.write() for supported formats. Station metadata are handled in a hierarchy of classes closely modelled after the de-facto standard format FDSN StationXML which was developed as a human readable XML replacement for Dataless SEED. See obspy.core.inventory for more details. See read_inventory() and Inventory.write() for supported formats. 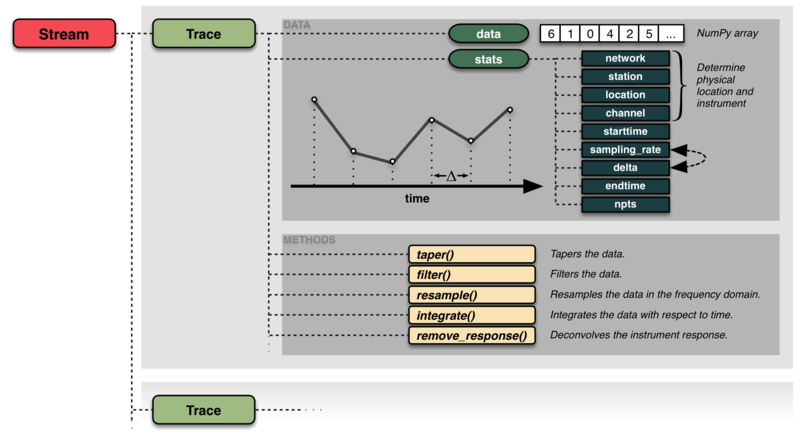 trace Module for handling ObsPy Trace objects. stream Module for handling ObsPy Stream objects. utcdatetime Module containing a UTC-based datetime class. preview Tools for creating and merging previews.